I loved The Rise of Io – in fact I’m just going to be totally reckless (‘fools rush in, something something something….’) and say that this is my favourite Chu book to date. I don’t know whether that’s because we’re back in the world of Quasings, whether it’s because it’s a world I’m already familiar with or whether it’s the characters of Ella, Io and The Scalpel – or maybe simply a winning combination of all of those facts – but I loved it. Firstly I would like to make clear that although this book takes us back to the world of Quasings this can definitely be started as a fresh series without the need to play catch up with the previous three books (The Lives/Deaths/Rebirths of Tao) – although, having loved those three books I do recommend them to you! That being said, knowing what it’s like starting a story already deeply behind I fully appreciate sometimes having a new place to start and so if you don’t enjoy playing catch up you could jump straight in with this one. Chu does a perfect job of laying out the basics of the world and the aliens that inhabit it and surprisingly, although I’ve read the previous books, this doesn’t come across as tedious in any way whatsoever – in fact I found the information really helpful after the break between books. Secondly, if you’re a little bit like I am – you’re maybe looking at these books and thinking, ‘mmm, sci-fi, not really my thing’ – if you are thinking that same thought let me just say that it would be a crying shame to miss these books for that reason. Of course the very idea of aliens is science fiction but these books are so very much more – thrillers, mystery, espionage, war and great characters. Basically the world created by Chu is one in which aliens exist on our planet. Unfortunately the only way for the aliens to function is to co-habit a human body and therefore over the course of history these aliens have been responsible for many significant moments in our world’s development. Unfortunately, the Quasings are at war with each other – in brief, they all want to return home and the only way to do so is to help humans to advance in their capabilities in order to make that a possibility – but they disagree over the way in which to do this. Split into the Genjix and the Prophus the Genjix take a fairly ruthless approach to human existence and see people as necessary casualties of their ultimate aim. The Prophus are more sympathetic to humans and don’t wish to cause unnecessary harm. And so for years war has raged between the two. At the start of the story we are introduced to Ella Patel. Ella lives in Crate Town and at the beginning of the story she’s in the throes of pulling off a con which leaves her running for her life when the gangsters she’s stealing from catch on! Of course Ella has lived in Crate Town for years and she knows the streets like the back of her hand. Pretty soon she finds herself, hidden in a dumpster, on the outskirts of town and playing witness to two characters who are themselves, similarly, being chased. The two, a man and a woman, are forced to defend themselves and when the man freezes Ella jumps in to help the woman as she fights alone. Unfortunately the woman dies and the Quasing that was inhabiting her body needs a new host – and chooses Ella. And so it begins. The process of denial and acceptance. The eventual realisation that Io’s mission is now Ella’s too. In terms of plot this is the usual fast paced and intriguing storyline that I’ve come to expect from Chu. We have an element of mystery to the book. Why is Io, one of the Prophus, in India? This is an area that is predominantly Genjix and so it’s both dangerous and puzzling. It seems that the Genjix have taken over a large portion of the area and are using it for a top secret purpose. Heavily guarded by the military anybody who steps into the wrong part of town seems to mysteriously disappear. On top of this we seem to have a traitor amongst the Prophus and that, coupled with Ella’s inherent distrust of anybody else makes for very interesting reading. Place. Well, we basically have a slum, where crates are stacked to create homes. This place is really not the sort of place that you’d like to wander into haplessly – even in the full light of day. Rough and full of thieves, conmen and gangsters one has to become tough to survive. The characters are what made this so enjoyable for me, well, I say that, but also the writing which so easily brings them to life on the page and turns them into characters that you will care about. Obviously we have Ella. She is a wiry, tough little nut with a heart of gold. I love her – the way she’s always looking for an angle, her prickly exterior, the fact that her best friend and burglar alarm is a dog, the way she steps in to help others and watching her have her first ever crush! Compelling reading. Then we have her Quasing Io. Io has lead a very long life but not maybe one that is totally noteworthy! Io is a fairly low ranked Prophus who isn’t going to find Ella an easy person to control or persuade. Such a different angle to the Quasing in the last books that it was a refreshingly unexpected surprise. The banter and struggle between these two is just brilliant to behold . Then we have the Genjix. Known as Shura the Scalpel with a Quasing called Tabs – she is absolutely ruthless and very appropriately named. Cold, calculating and ambitious. The very qualities that are prized in a Genjix Adonis. On top of all this the writing is wonderful. Chu is definitely smooth – there are no info dumps or flashbacks. With a few seemingly simple sentences he teases out his cast in a way that makes them spring to life, the same with the place. Literally, pages into this book and I was hooked. A thoroughly enjoyable read and one that I practically devoured in two bites and a finish that makes me wonder when the next book is due out?? No pressure Mr Chu. I received a copy of this through Netgalley courtesy of Angry Robots for which my thanks. The above is my own opinion. Time Siege is a great second instalment to the Time Salvager series by Wesley Chu, in fact I would say it’s even better than the first. There’s no shortage of action, a lot of character development and a twist at the end of the tale. In case you didn’t get round to reading Time Salvager my review is here, and, customary warning: if you haven’t read the first instalment this review could very well contain spoilers. Time Siege continues to take forward the story of James Griffin-Mars and Elise Kim. James, now an exChronman and fugitive, is in hiding with the Elfreth tribe and at the start of the book he’s hatching a plan. James is determined to save his sister from a disease that is slowly taking her life away. Having only just been reunited he’s determined to do everything in his power to find a cure, even if it means making more space jumps (that could potentially kill him) or bringing more people through time (and once again breaking the rules of time travel). Elise meanwhile seems to be becoming the ‘mother’ of the tribe, somewhat stealing her away from her efforts to find a world saving cure. The tribe is growing and more mouths to feed means more search and retrieve missions. The only option is to try and lure another person to make these salvage runs. At the same time we have Securitate Kuo from the Valta Corporation and all her supporting minions aiding Chronocom in their search for James and more importantly Elise! So, James sets off on a recruitment mission and Elise leads the tribe into hiding on the Mist Isle (previously known as Manhattan). There’s such a lot going on in this instalment. It has a different feeling completely to the first book and I thought it was very cleverly written managing to combine some great action sequences where you fear for everyone and wonder who is going to survive combined with some great character building. Personally I loved the journey through the Mist Isle and encountering yet more tribes and their battles with each other to try and survive. Alongside this was the shockingly awful tactics of Kuo who will go to any lengths to obtain her goals. This character is beyond ruthless and reading her POV was almost grimly hypnotic. On top of this we visit a remote and brutal prison where a rather daring prison break is made – but I won’t elaborate more on that point because of spoilers. In terms of the characters. Well, James goes through something of a meltdown in this instalment. He suffers from a massive bout of self pity that leads to some rather dreadful decisions. We know from the first book that James likes to find solace in the bottom of a bottle and his problem now really begins to show reaching a point where he is no longer capable of making rational decisions. I don’t suppose being constantly haunted by the ghosts of his past helps much in this respect. On top of that Elise is becoming more and more involved with the survival and running of the tribe, in fact her time is almost completely consumed by it meaning that she has less time for James – adding further to his sense of loneliness. He’s never really felt like a part of the tribe and now he can no longer salvage he feels worthless. Grace was one of my favourite characters from the first book and she still is in Time Siege. She’s just a total force of nature charging around bossing people about and putting everyone in their place! In terms of criticisms – well, I didn’t really have anything to be honest, this was a really entertaining read with excellent pacing. I think the only thing that stood out for me was that the whole ‘world saving’ issue took rather a back seat. But, I think that may be deliberate on the part of Chu – I think that issue may play a bigger role in the next book (although I could be completely off track with that). Both books in the series so far have had such a different feel and given the ending here I suspect that book No.3 will be the same in that respect. I think this has such a lot going for it. Urban warfare with dramatic fight scenes that are really well drawn, characters that are far from perfect but yet still make you feel something for them and an ending that leaves the way open for a fantastic conclusion. Yes, this is something of a cliffhanger of an ending but oddly enough not the sort of ending that left me feeling exasperated at all, although, obviously I’m really keen to find out how this story ends. Definitely recommended. I would also suggest that you need to read the first book in the series before picking Time Siege up. It might be that you could read this in isolation but personally I think the background and world building in the first is necessary to really set the scene. I received a copy courtesy of the publisher through Netgalley for which my thanks. The above is my own opinion. Earth is a toxic, sparsely inhabited wasteland­­: the perfect hiding place for a fugitive ex­chronman to hide from the authorities. James has allies, scientists he rescued from previous centuries: Elise Kim, who believes she can renew Earth, given time; Grace Priestly, the venerated inventor of time travel herself; Levin, James’s mentor and former pursuer, now disgraced; and the Elfreth, a population of downtrodden humans who want desperately to believe that James and his friends will heal their ailing home world. 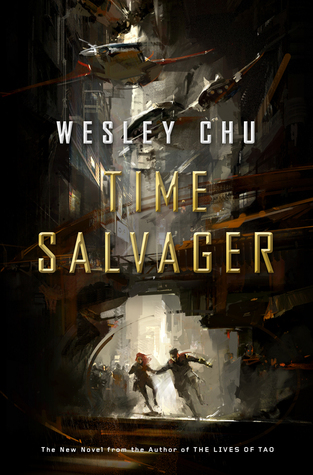 Just finished reading Time Salvager by Wesley Chu which kicks off what promises to be a very good series. Set in a future where time travel has become possible you would imagine the world would be a bright and shiny place, high tech and advanced. You’d be mainly wrong of course. The planet earth has become little short of a wasteland, so toxic and covered with sludge that most people have abandoned it and sought out life elsewhere in the solar system. Time travel is a dangerous job, jumping back in time is not exactly conducive to good health and added to that is the psychological impact. There are a whole bunch of rules for jumping back in time which I’m not going to go into! You’ll just have to take my word for it when I say that Chu has managed to write this in a very accessible and clever way. I’m not going to say that you couldn’t pick holes in it if you really wanted to because I have no idea if you can or not – I simply didn’t try. I just read it and accepted the whole ethos behind Chu’s set up. Maybe I’m just easily pleased but I decided to pay more attention to the story than the whole mechanics of it. After all the area of time travel can easily become fraught with ‘what ifs’ so I figured if I’m going to suspend my disbelief enough in the first place to read a story about jumping back and forth through time then I might just as well go the whole hog and believe the how’s and why’s that the author gives me. Simples. Our main protagonist James is a Chronman (a time jumper). He’s a bit jaded to say the least which isn’t really a surprise when you spend most of your time travelling back to times when massive disasters are taking place and people are dying around you while you just pop in and out and take whatever it is you’ve been sent to retrieve. It weighs on a person’s mind. The most important rule is nobody from the past gets brought back. Nobody has ever broken that rule until James, bogged down by his own ghosts, takes sympathy on a scientist called Elise who has caught his attention whilst on his latest mission and in a moment of weakness he takes her with him. Of course, this isn’t something that can be hidden and the authorities who govern time travel are immediately onto him. Now fugitives, James and Elise have to evade capture and try to stay under the radar and this is where they discover not only new allies but also the potential for a cure and possible hope for a brighter future? I thought this was a really good read to be honest. It has a very dark feel to it which isn’t really surprising. James is a jaded character haunted by the ghosts of all those people he’s had to watch die before his eyes. The world really holds no appeal for him and he longs for a time when he can just get out from this job. On top of that the world in which he lives is also miserable and seedy and the other inhabitants suitably repressed. Yes, there is a whole feel of doom and gloom but it’s fitting for this part of the story. Chu manages to make you feel the lethargy and you almost become annoyed reading at the way people have simply lost hope and no longer seem to have an inner spark. Then, we have Elise, who unexpectedly becomes part of James world. Being from a different era she manages to bring with her a little ray of sunshine and hope into this world. She simply hasn’t given up yet and she still cares enough about the world and the people on it to try and make a difference. The Characters. Well, in spite of James hardboiled and prickly exterior I quite liked him as a character and found the interaction between himself and Elise interesting. I think watching his development is going to be very intriguing. Chu has a way of writing characters and relationships that give them time to become meaningful. He doesn’t rush them but allows them to grow and adapt so that you actually feel yourself starting to care about them. Now enter the scene Levin. Levin is an auditor and he’s been given the task to find James. I kind of felt sorry for Levin to be honest. He’s one of those characters that really needs to get a life! He’s just so bogged down by rules and playing everything by the book that he’s become almost inhuman. His adherence to the rule book and failure to see things other than black and white means he basically spends a very lonely existence as people simply don’t like him. Again, i think it will be interesting to see how he adapts. My favourite character so far though has to be Grace. I just couldn’t help liking her. She’s like this 93 year old ‘mother of time’ sassy, argumentative character. She definitely brought a little something more to the story and much like Elise hasn’t been bogged down by the present world’s dire predicament. The setting is very well done. We have the grime and filth of the city where people shuffle around aimlessly trying to eek out a living. From there we move out to the ‘wilds’ as James and Elise try to evade capture. The landscape then becomes quite a contrast and is vividly imagined. We actually come across areas that don’t seem to have completely fallen into despair yet and groups of people who are still willing to commit to each other. On the whole I thought this was a really good read and I’m looking forward to seeing where Chu goes next. And after reading the Tao stories I think that what we can expect from this author is the unexpected. I received a copy of this from the publishers through Netgalley for which my thanks. The above is my own opinion.